I finally got the printer started tonight . But I have a problem with two of the stepper drivers. They just won't adjust the voltage, no matter what way I turn them Any advice would be appreciated. I found the angle in which I touch the pot with the probe at makes a difference. Most of my drivers don't care, but some I have to touch them just right to read them. Thanks, I’ll give it a try. I thought that the drivers might be faulty. I was hoping I would be doing some test prints today but it’s not looking that way. Is it worth putting dampers on the stepper motors? I’ve read that it makes the motor less noisy. Does anyone have them on the FT5? I really like them and have no plans to ever remove them. Thanks for the reply Ron. Can I ask, what stepper motors did you put them on? Yes, two of them . The amount of times I’ve tried to adjust them, I think the pots have definitely deteriorated now. Can I ask, what stepper motors did you put them on? I just attached them to the standard motors from the FT5 kit. There is really no need to change the motors that I can see, though I did try a 0.9 degree motor on the extruder before changing over to a geared Titan version (with the original 1.8 degree motor). The 0.9 degree motor did not have remotely enough torque to directly drive the original extruder. To be clear, the dampers I am talking about are two metal plates with a rubber cushion in between. They attach to the motor faces and then to whatever the motors originally attached to. I have them on all the motors except for the extruder. Some people have referred to inline diode boards as dampers. If that is what you were referring to, I have not installed them on my printer and have no plans to do so. If I wanted to try something like that I would just build them as I have a bunch of 3 ampere Shottky rectifiers in a box lost somewhere in my workroom. But again, the rubber dampers work so well that I see no need. Thank you for the information. I bought some metal plates/rubber dampers. Would i need to change the bolt size to a longer length? 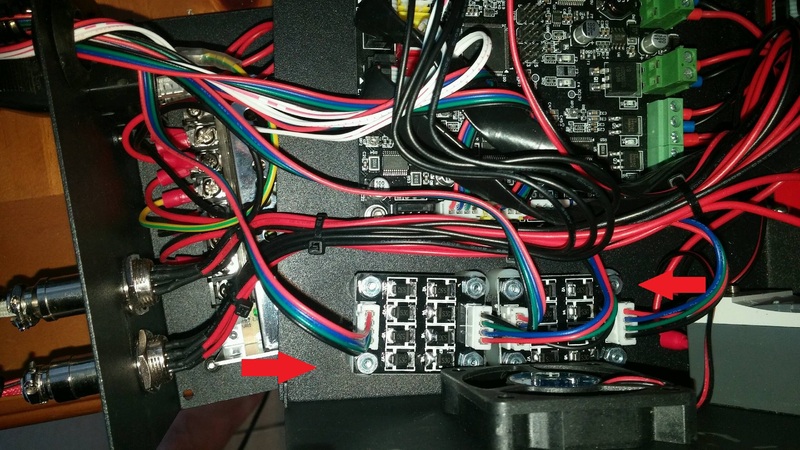 So I haven't printed anything on my FT-5, due to the 2 faulty stepper drivers. The local printer shop only has the drv8825 drivers. The guy at the shop also recommended using TL-smoothers with the drivers. Would it be okay to use them in the FT-5, and would I need to change anything, like in the firmware or are there voltage differences to the 4988 drivers? Searching on the internet, there seems to be mixed results, depending on the printer it seems. I highly recommend the smoothers! No software settings needed, just plug in line with the motors. there are also mounts for them on thingyverse. depending on your drivers of course but i use them on my tornado (mks 1.4 board) and all the fisheye disappeared! 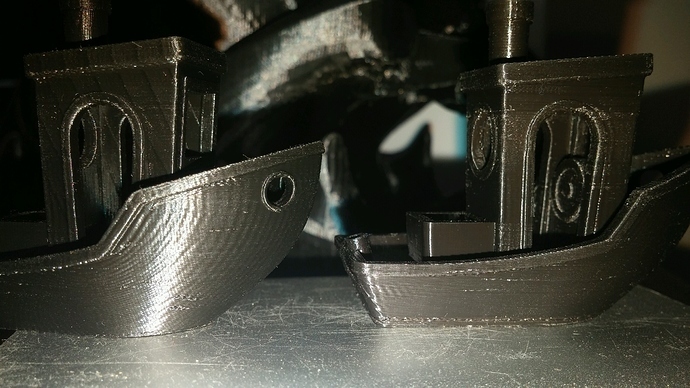 see ringing on tower of left benchy. none of that in right. this is an easy and cheap upgrade! Thank you for the advice PaulS. Are you only using the TL-smoothers on the X and Y axis? Since I still have 2 working a4988 drivers, could I use them with 2 x 8825? I was thinking a4988 for the extruder and Z axis, and 8825 with TL-smoothers on X, Y axis. Would i need to change the bolt size to a longer length? No. At least not with the ones I bought. One plate bolts onto the motor face with some short screws and the other plate bolts to whatever the motor used to fasten to with whatever screws it was using before. I highly recommend the smoothers! OK, based upon your recommendation I may try them after all. But as I said, I have loads of Shottky rectifiers in a box or drawer somewhere so perhaps I'll just build a couple of them. The rubber element dampers really do help with acoustic noise though. Night and day difference in the case of my printer. On a slightly different note, the quiet fans I installed a few weeks ago are working out perfectly. The machine is close to silent now, to the point that when I walk out of the room while it is operating I can just barely hear it. Thank you for the help. The rubber dampers and TL-Smoothers seem easy enough to install. I was hoping to have my printer running today, but the person i was buying the Smoothers and drivers from won't be available until Monday. Ever since I built the printer, I seem to be having delays in getting it going. I'm starting to get the distinct feeling that the universe doesn't want me to have a 3D printer, . Luckily, I have the patience of Job and it's just a matter of time, I guess. ah welcome to the club! LMAO you have been offically promoted to 3d printer nerd 3rd class. waiting for parts can be a way of life, watching the clock day after day hopeful today will be Christmas all over again Soon you will learn what your reorder points and consumables are and why maintenance is so important on these poor machines. I am on my 2nd 5 day print in less than 2 weeks so trust me when i say you will get there, patience is the key! get frustrated, walk away! 1st and foremost this is supposed to be fun and i think i can speak for my peers when i say it really really is!!! it's remarkable how much quieter it is. I only installed in x and y (so 3 dampers), and it's night and day difference. I know many people have said that, but hearing is believing. The main ones are the Z endstop, bar removal brackets and FT-5 C-Cooler. Good luck with your first print.